The lady pop sensation has made it to Beijing. One of our fellow teachers invited us to dine at a North Korean restaurant. Unaware of North Korea’s love of bubble gum pop, we joked that North Korean food would be rice gruel in tin bowls and the servers would wear gray jumpsuits. We were so wrong. Not only was the food amazing, but stunning North Korean women (who also are the waitresses) put on a vibrant show. The women danced and sang Chinese and American pop songs— including Abba’s “Dancing Queen”—while playing the saxophone, drums, electric violin, cello, harp and the most exciting instrument ever – the KEYTAR! Unfortunately, we have no photographic evidence of our night with these dancing queens. When birdMAN got out his camera while being served beer and kimchee, the four waitresses breathed audible sighs of anxiety and skittered away from the table. We were, however, allowed to photograph the paintings of the women. Who are these mystery women festooned in makeup, polyester jump suits, and sequins? They look nothing like the gaunt, plain, austere North Koreans that we would expect emerging from Asia’s last Iron Curtain. Our friend told us that they work at this restaurant for a few years and then return to North Korea. Their work life is like working on a cruise ship. They do not leave the building without supervision. That is all we know of these North Korean beauties. We left the restaurant with full stomachs and full hearts. Now months later, we crave the bibimbap, the sweet rice dumplings, the seared beef, and beer. We cannot forget those picturesque women’s pensive stares; their small speaking voices that belt out dynamite serenades. Abba tunes synthesized with the electric violin and keytar continue to resonate within us. Who would have known? I have something in common with North Korea’s dear leader: we both love kimchee and pop music. I first met B & S in 2008 at an intense two week training school for teachers in Fairfield, California. Not only could they win a “Best Looking Couple” contest, but their pleasantly matched personalities and easy demeanor made them a favorite among both students and teachers. They were also learning Mandarin Chinese. I, of course, had absolutely no interest in learning Chinese, let alone living in China. After the class’s completion, we exchanged emails, hugged goodbye, and promised to keep in touch. 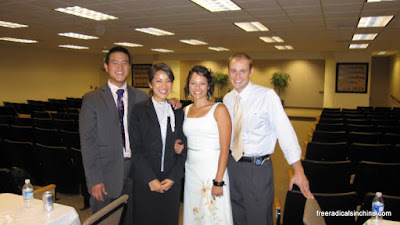 About a year later, S included me in a mass email inviting the recipients to view her online Picasa web album showing their recent move to Taiwan and their romp through Southeast Asia. S’s beaming face as she stood on the ruins of Angkor Wat, Cambodia. B gorging on fish in Korea. Sleeping on trains from Vietnam to Thailand. Cambodian children. Pho in Vietnam. What an awesome couple, I thought. Last year, I ran into B & S at a large party in Fremont. They were ecstatic to hear that we were moving to China later that year. We caught up for a few minutes, and mused whether we would meet up on the other side of the hemisphere. They ended up in Beijing last October, one stop on a month long tour of China. They slept in our campus dormitory, had to schedule showers according to the hot water schedule, and ride the bus and subway to Beijing’s historical sights. Even though we were busy teaching English, we made time to introduce them to our favorite Korean BBQ restaurant and street food (lamb chuanr + beer), whine over the extravagant prices at Element Fresh, and unsuccessfully bargain over cheap clothes at Dongwuyuan (one of my favorite places to find factory made brand names but rejected for shipment to foreign stores). The week was over before we knew it, and they headed south to Guanxi province. As the May holiday (a.k.a. Labor Day, yes China celebrates Labor Day too!) approached, we contemplated jetting over to Korea to eat some bibimbap and kimchee. We remembered our friends in Taiwan and chose to visit their sub-tropical home and anticipated using the internet uninhibited by China’s great firewall (hello YouTube!). Both B&S and Taiwan welcomed us with open arms. Our base camp was B&S’s comfortable 14th story apartment, nestled in a not-so-busy corner of Taichung (台中) above well-stocked grocery, beauty supply, and stationary stores. In contrast to Beijing’s honking taxis, the hordes of people crossing the streets in a chaotic fashion, the yelling salespeople advertising fruit and vegetables, and general pandemonium, Taichung felt so peaceful, so harmonious, so chill. Clean –Even though public garbage cans are nonexistent, the streets were devoid of garbage. I realized I have grown accustomed to seeing people nonchalantly throwing their snack wrappers where ever they happen to be standing. Obedient to traffic laws – When the light was red, even if no crossing traffic obstructed the path, the scooters, bicyclists, cars, and pedestrians obediently and patiently waited until the light turned green before accelerating. In Beijing, I tag along with the traffic law offenders and ignore the cars angrily (and rightly so) honking at us. Island feel – Breathe in, breathe out, breathe in, breathe out. I imagine that Taiwan’s moist air purged Beijing’s dust and grime that has accumulated on the linings of our lungs. A much needed lung cleanse. The weather was pleasantly humid and comfortably warm, a welcome change after the 7 months of winter we have endured. We also escaped the city and enjoyed Taiwan’s lush greenery with a mountain hike and bike ride around Sun Moon Lake. Of course, we did what we do best…WE ATE and WE ATE. Fortunately or unfortunately, B&S’s view of food is the same as us—not only is eating food necessary to sustain life, but a way to enjoy life. The food adventures began with a hot dog at none other than Costco. That hotdog tasted exactly like the $1.50 polish-dog in Vacaville, California. Like our hometown’s Costco and every other Costco in the world, the aisles teemed with sample hording patrons loading their carts with rotisserie chicken, California wine, Kirkland almonds and tortilla chips. We left Costco with a gallon of olive oil, a block of sharp cheddar cheese, a bottle of Menage-a-Trois wine (from California!) and a package of Pilot erasable pens. Never before would we have vacationed at Costco, but this trip was a great start to our food holiday. Taiwanese beef noodle soup: A trademark Taiwan dish: Noodles in a beef broth, melt-in-your-mouth beef cubes, a marinated egg, and a kick of spice. Make sure to order the soup minus the duck blood tofu, a usual addition to the spicy broth. To my horror, mine came with blood, which we promptly sent back for a new dish. Snake soup: We sampled snake soup at a tiny restaurant that appeared to have four-fold purpose: cage the snake, kill the snake, cook the snake, and eat the snake. Snake soup is widely believed to rejuvenate the skin. Perhaps this belief stems from the smooth feel of snake skin? Resulting in great skin or not, the soup is surprisingly tasty. The snake meat and skin are simmered in a simple gingery broth. The snake meat tastes like chicken and the skin is chewy. Poor snakes. I wonder if they know that we are eating their friends? B was a little grossed out by the caged snake smell, so it was up to S and me to finish it off! Pearl Milk Tea: We drank bubble milk tea at its birth place,Chun Shui Tang (春水堂). I love the Old Tea House in Davis, but this bubble tea is about a 1000 times superior. The bubble tea is a mixture of milk, tea and small chewy tapioca balls, which are slurped through a straw. The BEST milk tea ever! Night Market Street Food: We gorged on rice and kimchee hot dogs, fried chicken topped with gravy and salsa, chou tofu, watermelon juice, and tapioca drinks until we felt like exploding. Street food is amazing in Taiwan! We enjoyed the food and the sights (and Costco) immensely, but more importantly, we enjoyed spending time with our friends. We laughed, we ate, we drank, we hiked, and we contemplated the meaning of life. Funny, some people you just connect with, even if you only see each other once or twice a year. It is nice to know that friends will be friends. Thanks B and S for an awesome, fun time in Taiwan! Love you guys! Click here for pictures of Taiwan.